CHICAGO (January 14, 2016) – Much has changed since 1991, when gas was $1.18 a gallon, “Beverly Hills 90210” premiered, Mariah Carey won the Grammy for Best New Artist and Patrick Swayze was the sexiest man alive, according People magazine. And here in Chicago, the growing fervor for equal rights for lesbian, gay, bisexual and transgender Illinoisans led a small band of leaders to launch a fledgling organization now known as Equality Illinois. 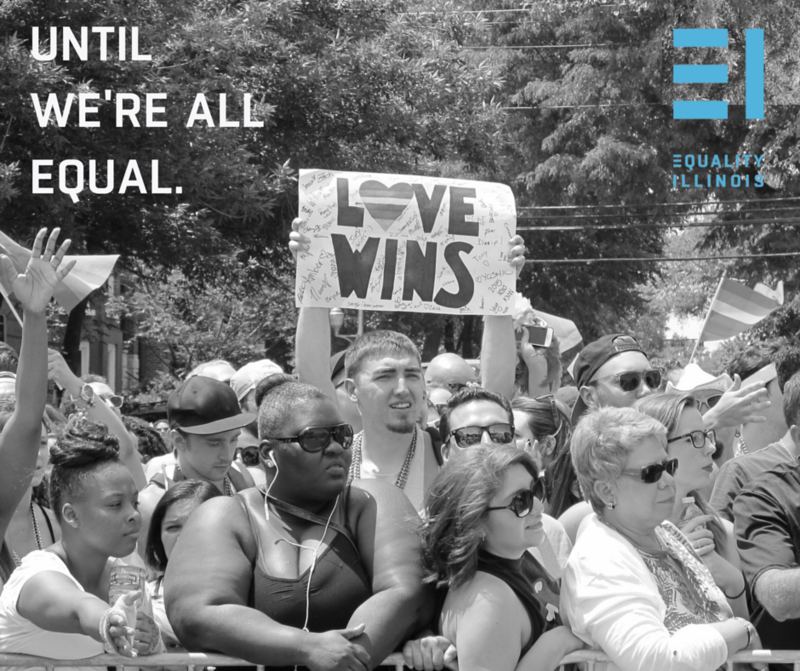 For 25 years, Equality Illinois has won change across the state, from basic civil liberties to full marriage equality and more historic milestones since then. Today, Equality Illinois is thrilled to launch a new brand–one that captures the excitement of our work and reflects our enduring commitment to equality for all. “In the wake of high-profile successes, we have retooled our organization to build an Equality Illinois that is ready for the next phase of the movement. We’ve expanded our spending, grown our initiatives and opened a Central Illinois office to better meet our legislative, defensive, and educational priorities,” said Bernard Cherkasov, CEO of Equality Illinois. “We’ve learned from other civil and human rights movements that high-profile political, policy and legal victories do not end the work of seeking social justice. We must reinvigorate ourselves, because when we’re not vigilant, we are vulnerable. Now is not the time to disengage,” Cherkasov said. Founded in 1991 as the Illinois Federation for Human Rights, an advocacy organization, the name was changed to Equality Illinois in 2000, when the Equality Illinois Education Project, a 501(c)(3) arm, was also created to focus on the educational and charitable aspects of the mission. This year, the name of the Equality Illinois Education Project is being changed to Equality Illinois Institute to better reflect its role in engaging and educating the public, government and private establishments about equality. A third related organization, the Equality Illinois Political Action Committee, will continue to assertively pursue LGBT priorities at the ballot box. “Changing laws is just the foundation for securing lived equality for all Illinoisans. Our work continues through conferences in Chicago and Central Illinois, publications and training sessions for businesses and government agencies plus contributing an LGBT voice to the broader conversations on racial equality and social justice,” Cherkasov said. Equality Illinois’ new branding–designed with the assist of Purple Strategies public relations group–can be seen on our website www.eqil.org and on social media, and it will be incorporated into new and updated publications. 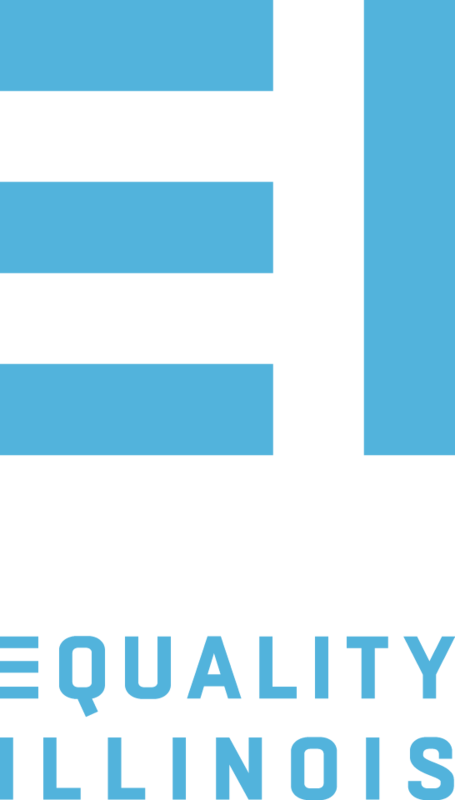 At the heart of the stylized “EI” shield is an equal sign, inseparable from the brand and organization. The bold color scheme and the clean unencumbered look are meant to convey a sense of clarity, openness, forward-thinking and focus. Here is an example of a social media meme, part of a campaign we are launching today to inform the public of our refreshed look and enduring commitment.